Some of the people from Constituency Number Two who took part in the last Health Walk pose for a picture with Prime Minister Dr the Hon Timothy Harris at the end of the walk. From left are Mr Leroy Henry, Ms Solaine Ayobe, Mr Nubian Greaux, Mrs Lucy Greaux, Prime Minister Harris, Chairman of the PLP Mr Warren Thompson, and Mr Alfredo Rodriguez. 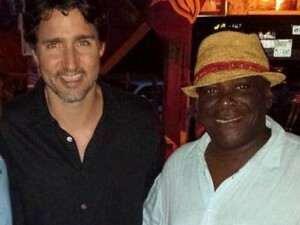 BASSETERRE, ST. KITTS, May 31, 2017 (PLP PR Media Inc.) — Communities in Central Basseterre (Constituency #2) will on Monday June 5 (Whit Monday) have the opportunity to revisit the grandeur of past days courtesy of Peoples Labour Party (PLP) No #2 Branch when it holds a sporting fun day at the Gardens Playground. 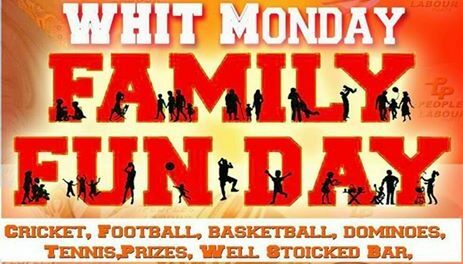 According to Mr Greaux, from the football aspect of it, they hold activities on Whit Monday but their intention this year is to revive that aspect of the family sporting fun day by incorporating other sporting disciplines that will help to bring together people of all ages. 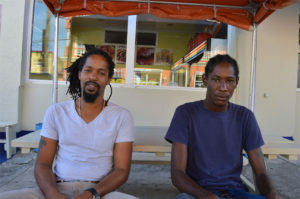 Mr Nubian Greaux (left) with Mr Diovonne Richards, who are organising the Sporting Fun Day for Whit Monday June 5. “It used to be held every Whit Monday and it involved people from Constituency Number Two entirely,” said Mr Greaux. “I do not know why it died, but I guess there was some sort of committee in place and it just fell apart, and it just ceased to happen annually. To make the day a success, the PLP #2 Branch Chairman is being assisted by Mr Diovonne Richards who is the person in charge for the youth, and members Mr Leroy Henry, Mr Isaiah Newman, Mr Christophe Greaux who is also PLP’s Deputy National Secretary, Ms Jackie Dyer and Mr Urban ‘Massive’ Penny. He advised that events are expected to start from as early as 9:00 am with cricket that will then make way for football and basketball later in the afternoon. While football and basketball will be going on, they will simultaneously hold draughts and dominos which are aimed for the older folks to enjoy. Invitations are out for people from as young as five years to those who are over 50-something years old, males and females, players and non-players. He noted that this arrangement would make it possible for a wider age group to participate in what promise to be a fun packed day for all of the family. In the meantime, Mr Nubian Greaux has thanked Prime Minister and Political Leader of the People’s Labour Party (PLP) Dr the Hon Timothy Harris for involving the communities of constituencies number Eight, Two and One in his monthly Health Walks. He described the move as a welcome one because of the health benefits people stand to gain. 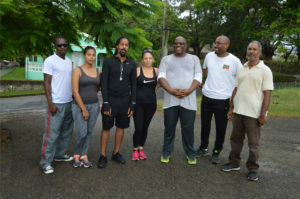 “While it was unfortunate that it did not take place as planned last Saturday as the Prime Minister was away, we are looking forward to taking part in it next month and I making am appeal to people in Number Two to join the Prime Minister in this walk,” appealed Mr Greaux. The walk whose new date will be announced later would start at the St. Peters Community Centre, proceed along the Main Road to the Shadwell Roundabout, then south towards the CFBC, then east along Cayon Street, and continuing east along Pond Road and ending at the last round about in Frigate Bay.